« Educational Happiness: Why do Canadian Parents Shrug-off School Concerns? These schools will not be inclusive to students with autism who have sensory issues or for those with focus issues. It would be like having a school without a wheelchair ramp or elevator for those students challenged by stairs.mWhat are they thinking! I am sure they are cheaper to make but the do not serve the client ….. STUDENTS. Why is this idea painted in such a completely negative light? Some children/teens might thrive in this environment and why shouldn’t they be given the chance. Maybe we should look at this as an opportunity to spearhead school choice into Nova Scotia’s school system. The idea that the current traditional classroom is quiet and that there is little student traffic, noise and distraction is simply not the case. Students are constantly moving in and out of the classrooms to go to various individual/small group learning activities throughout the day such as resource, choir and speech therapy. The number of interruptions that happen in an elementary child’s school day is truly astounding. Many technological advances have happened since the 70’s which make this an idea which should again be given a chance. Children who are independent workers or are gifted might thrive in this type of environment. The traditional school system is often leaving children bored. Time to think outside of the box and this might be a great place to start. This idea is as dumb now as it was in the 1970s. SEFs schools as they were know, were quickly very unpopular. This is designers trying to force feed pedagogical change without a clue what they are doing. Who actually asked for this or is it all ego? I agree Doug. This is some educrat’s idea of busy work. Way back in the 1970s when I began teaching and later in the 80s when I taught elementary grades the story I heard was that these schools were set up because they were cheaper to build, not because they promoted learning. If they did there seemed to be no professional development to help teachers (like me) work in those open environments. So, I must side with Doug et al on this one. Kim’s use of qualifiers such as “might” are a poor substitute for proof. Then again, the history of education is so often a history of untested assumptions. While I want more outside the box thinking, this initiative does not cut it in my view. Below is a set of designs and depictions of schools throughout the world, including The Seven Stones Community School. Have a few questions/comments for the Seven Stones in Regina. Separation of children by grades. Don’t really care for that aspect, since I think that children of all ages should socialized from time to time. I also believe the playgrounds are small, but it is hard to time without the dimensions and sizes on hand in the depictions. I suspect it would required a lot of prep time and planning for teachers. Plus there is not a lot of privacy for teachers. They get the space, and have to let go of the privacy. Would it not required and perhaps in some cases 3 teachers in a classroom? I know it would not be ideal environment for any of my children. Too many distractions. Some children will blossom, others may struggle. Also are the designers, imposing their impressions and beliefs on what and how children learned and play in a school environment? It just strikes me, that no educators coming from diverse backgrounds and school environments played any role in the designs of the schools. It also strikes me as being too institutionalized, and reminds me of hospitals of the newer designs. Suitable for hospitals, but schools? But the schools are being built, but whether it can bring the family environment experience inside the school walls, is another question that could only be answer after the fact. Certainly teachers would have to be on their toes and it be a long day for the teachers in planning, especially when teachers want to change the commons, or reconfigure the classroom pods, to make room for another teacher and lessons. What strikes me the most, is the disposal of the old schools. Personally, I think all schools of the K to 8 kind, no more than 200 students. High schools, no more than 500 maximum. Why not modernized the schools, instead of building new ones? Why not solar heating, perhaps sky lights, LED lighting, upgrading to adapt to the 21st century technology? Expand classroom sizes, create commons for students to gathered at lunch time, recess times, and give teachers their own common or commons for privacy and collaboration. Imagine a school built in 1900, still standing proud in 2050 just as it was when built in 1900, but the inside of the school has been transformed in a 21st century environment, encased in the early 20th century structure of a school building. Respecting the history, of which the school was built on. It has to be a lot less expensive, than the current pathway of discarding, closures, and building new. Schools could take on the look built on the pedagogy theories and practices, standing besides the sciences of learning.and its 21st century knowledge. . .
What happens when you add a computer to this scene? A printer? A scanner, a video monitor, a telecommunications system? Designing a technologically-rich school for the 21st century means more than simply plugging in the equipment. Computer networking, video conferencing, and new approaches to learning make traditional classroom configurations impractical. The schools of tomorrow may take on shapes that will seem foreign to us today. Bingo! That’s exactly why the architecture, one which was based upon a single person who had the knowledge and a group of ignorant children who would be asked to catch the pearls of wisdom and information falling from his/her mouth has to change. Technology, access to so much more information…that in and of itself breaks the walls of the classroom. But Fielding Nair isn’t all about open classrooms. They’ve plenty of different patterns that fit the needs and desires of the 21st century learner, so I think this article is decidedly biased and misinformed, or perhaps myopic. And this author’s listing of the principles upon which this concept is based? What’s wrong with that? That it’s “Progressive?” Seriously? Progressive education isn’t just “open classrooms.” It’s Dewey and his ilk…people whose time has, perhaps, finally come. Even though we like to talk about Dewey as a founder of the American Public Education system, we ignored the majority of his progressive concepts in favor of control and systematic production of student widgets a’la Thorndike and operant conditioning. Thanks for joining the discussion, Garreth. You seem to be taken in by the Fielding-Nair design philosophy and design principles. My commentary raises questions about the open concept classroom so central to their design framework. Since it was written, school architects specializing in smaller concept rooms have begun advocating new spaces for Learning Challenged Kids. Experts in acoustics have never favoured open concept classes because of the noise levels and distractions affecting on-task time and learning focus. Just two examples of why these creations need to be rethought for the sake of students in today’s schools. One of the hallmarks of an educated critic is to know what they are talking about. Experience is one way to educate. I have 40+years of experience as an educator. I see a great deal of “what ifs” in the article and accompanying comments and very little experience with either the 21st century teaching models or the structures that support a variety of styles of teaching and learning. These schools are not the open concept schools of the 60’s. They are flexible and capable of creating enclosed space when needed and open space when it suits instruction. Another important difference is changing the instructional model of the past to coincide with the spaces designed to accommodate a variety of teaching needs. Teachers who excel in these environments have made the shift to inquiry based learning coupled with 1-1 instruction and a variety of small group instruction to meet specific learning needs. They did this before they were moved to the new building. The teachers work in teams and collaboratively plan to meet those needs as opposed to one teacher trying to meet all the needs of a diverse class of 25 students. We have a culture of working from good data about student growth so specific needs are known. We are able to focus on individual’s needs and work toward the goal of student success for ALL. These comments are based on own teaching experience, my observations of the collaborative designs for the school created with student, parent, teacher, and community working design sessions and observations of collaborative teaching in action. Just curious on the number of teachers per grade, and what of the students with disabilities such as learning disabilities or on the autism spectrum? The data streams are depressing concerning LD students. For the most part, anywhere between 94 to 96 percent of LD students remain low achievers and the small percentage that become relatively successful in school, are students that received outside help correcting the reading, writing and in some cases the numeracy problems. What will be different for children struggling in the basic foundations of the 3 Rs, in the modern 21st century open-concept school compared to the regular school, of enclosed classrooms? Funny thing regarding LD students, all have core problems in reading, that cascades and expands into writing and numeracy. As a teacher, and a trustee, do you not find it odd that the part of the definition, average or above average intelligence. The 21st century schooling did no favours for my youngest child, who was identified as having dyslexia, Now that she is 17, administrative policies are just as brutal as they were back in 2001, but doing well academically spending many hours after school, re-teaching and tutoring, on the foundation that is really no longer taught. Some of the top experts in LD, will say the LD students are the canaries inside the school, but the reading experts will say the canaries inside the walls of the school, are all students who are struggling in reading in some aspect, and to which keeps them from achieving at their best ability. The new way of inquiry-based learning,, one to one instruction, and small group instruction to addressed individual’s learning needs, are only as good as they are, if if the instruction methods are regularly accessed to checked for effectiveness. It be interesting, if as you have described, will improved the students with reading, writing and numeracy issues, who sit at the bottom of achievement continuum. Time will tell……….. I have to agreed, after reviewing a few of the plans. Obviously, the open-concept schools of 2012, have the extra bells and whistles of sky lights, solar heating and other environmental features that will make the new open-concept school a pleasant and pleasing environment.for teachers. But will it work for the students of all shapes and sizes? on September 20, 2012 at 12:00 am | Reply J.T.C. Barbara – I am a product of the open concept experiment in the Ontario of the 1970s where there was no instruction and no report cards. We were permitted to do pretty much whatever we wished to do.They called it “self-directed learning”. We were also a bunch of kids who, when the system realized its mistake changed us back to the old traditional classrooms, were light-years behind. You may not use “what ifs” but you use buzz words that for me send up all kinds of red flags for me. Experience is also a way of learning by mistakes made. The biggest mistake ever was my parents keeping me in that school and not transferring me out. Post-secondary and job experiences taught me the hard way that doing what you want when you were ready just doesn’t cut it. I am writing as an adult who attended two of the open concept schools in Toronto in the early to mid-70s (Roden Public School and Howard Public School) and who also attended traditional schools in Toronto during the same period. I feel compelled to share my perspective as a young learner during that period. As a child, I recall recognizing the differences between the experiences immediately. Those differences have stayed with me through my adult life and I’ve only recently taken the time to research what ‘happened’ during that time in Toronto (why were my experiences so different from one school to the next?). It doesn’t surprise me to learn that some experimentation was going on. I am glad that I had the chance to be exposed to the open concept model/learning environment. I remember it as being ‘freeing’ in the sense that I was not anchored to a desk throughout the day. Rather, I had opportunities for hands-on learning experiences in conversation with other children, including working with/observing live animals and at reading stations where we could sit and read aloud in a less structured manner, surrounded by the books (just to name two of the various opportunities). It was very engaging. Somehow, the kinetic experiences of moving through the learning environment and the day-to-day hands-on learning really appealed to me much more than staying in one location through the day (the traditional model). I felt more connected to the learning environment and less constrained. I imagine that comparative quantitative data have been used to evaluate the performance of students in each of those systems and I endorse evidence-based decision-making approaches. However, I can only say that as a person who attended two such schools during childhood, my learning experiences were enriched and those experiences have stayed with me. And, those experiences may have also contributed to how I approach the world today – collaboratively, with curiosity, and with as little rigidity as possible. The open concept learning environments were certainly not perfect (what is? ), but I benefited from them and I imagine many other children did, as well. I can see how a thoughtful hybrid, such as described by Barbara, would be ideal, particularly given the broad range of learning needs of children. In any case, the enhancement of inquiry-based learning models will serve our children and society well into the future, I believe. Good luck with the new, improved models that are being developed and introduced today. As a former student, I look on with interest and enthusiasm. Having one of Regina’s elected public school trustees engaged on Educhatter adds significantly to this online discussion. The Fielding Nair International schools do have attractive exterior and interior designs, and that I recognize in the commentary. So did Kate Hammer in her feature story. Your claim, Dr. Young, that the commentary is based on “what ifs” is less convincing. As an educator, you clearly have an appreciation for the advantages of what are termed “21st century learning skills.” They are not in dispute in this particular discussion. What is under review is the impact of “open area classrooms” on student learning, noise levels, student behaviour, and the welfare of students with special or complex needs. Designing bigger rooms, I am sure you recognize, are bound to make “inclusion” more difficult and intensive teaching next to impossible. My commentary is based upon a whole lot more than speculation. You must have missed my references to Dr. Neil Gislason’s recent research. He’s the leading Canadian expert on school design and he’s skeptical about the claims made by Fielding Nair that their schools are transformative. You also make no reference to M. Costa’s fine 2003 literature review, written from the viewpoint of a working teacher. He is a British Columbia teacher with experience in the trenches. Noise levels, he contends, are a major problem that should not be simply brushed aside by school design architects. You are an experienced educator with an advanced degree, but so are at least a handful of others who regularly contribute to this EduBlog…and you will note that we do not buttress our arguments with claims to being experts. That’s an academics game, played out safely within the womb of academe. The Regina Public Schools has a lot on the line. Your school board, Dr. Young, has committed heavily to the Fielding Nair International schools design model. That has attracted critical attention because it may represent a new trend in a field known for copy-cat decision-making. It’s entirely appropriate to ask the tough questions now, before “open area classrooms” become the norm and our children’s education is further compromised in the K-12 school system. Experience has taught me in education even with positive reforms you simply cannot jump from one boat to another without falling in the water most of the time. Trying to force feed new pedagogical styles through architecture is a formula for disaster. This must be done very slowly over a very long period of time and I mean 30-40 years. I find Dr Young’s comments “educational gobbledy gook” and I have been around these issues in one form or another for 40 years. Teachers are very conservative in the sense of ‘slow to change and very sceptical of change for change’s sake’ they have seen too many fly by night bandwagons and white elephants. Schools should be ‘designed outwards by teachers’ not by architects and dreamers. Paul W. Bennett’s commentary creates confusion rather than builds awareness. In the “About EduBlog” section of his blog, he writes that he is “seeking informed commentary.” However, his own description of Douglas Park Elementary is clearly uninformed. In a classic “straw man” argument, he first inaccurately describes the school’s design as “open concept” and then spends the rest of his piece trashing open concept schools. For all his concern about the education of children in Regina and Canada, his entire piece represents shoddy research which piggybacks on another reporter’s uninformed work in the Globe and Mail. Paul, did you visit Douglas Park Elementary School? We invite everyone participating in this blog to take a look and judge with your own eyes. This is not an open concept school. There are 32 discreet learning spaces on two floors, including 11 Learning Studios (we don’t call them classrooms only because they are outfitted to facilitate many more modes of teaching and learning than traditional classrooms), three Seminar Rooms, five Quiet Rooms, three Small Group Rooms, three Teacher Collaboration Rooms, a Media Resource Centre, a Gymnasium, a Developmental Centre for Special Needs Students, three Learning Commons’ distributed between Grades Pre-K-2, Grades 3-5 and Grades 6-8, and a Central Learning Commons–the heart of the school. What’s different about the design at Douglas Park and also Lord Kitchener School in Vancouver is that there is a greater variety of spaces, accommodating the needs of a diverse group of learners and also a diverse group of teachers. To that point, Fielding Nair conducted extensive consultations with teachers, including Best Practices and Curriculum Mapping workshops which did address concerns like acoustics and student distraction. The process has been well documented, with written narratives, timelines and images. Contact me via email at randy@fieldignnair.com and I will share the documentation with you. In other words, this is a school that your educators requested, thoughtfully and artfully customized to your community’s unique needs. A far cry from the superficial caricature of an open concept school that Bennett has drawn. 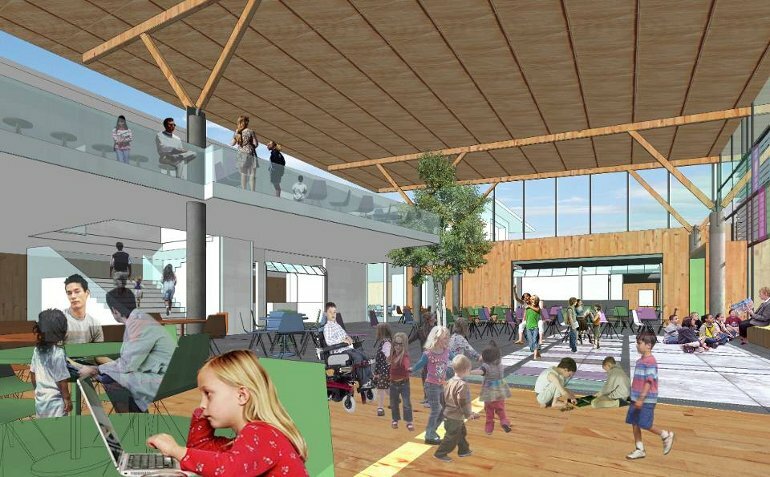 The Design for Douglas Park Elementary is neither a re-creation of a failed experiment of the seventies or an experiment with Regina’s youngest citizens. It is a result of work done in your community and supported by more than two decades of hands-on experience in school design around the world. Consider what Dr. Phil Long, Superintendent of Medford School District in Oregon writes about two elementary schools we planned that incorporate many of the underlying principles that can be found at the Douglas Park School. “I am writing to express to you my utmost respect and appreciation for the work of Fielding Nair International (FNI) in helping us transform the learning spaces at two of our oldest schools, Jackson and Roosevelt elementary schools….The work that Randall Fielding and his team did with the staffs at these two schools allowed us to honor strong traditions of teaching and learning while reshaping the physical spaces to better support 21st century learning. What I most admired about this process is that it focused first on student learning and anticipated the flexibility needed to meet diverse learning styles and needs. Staff and parents were involved in the deep discussions of how the bricks and mortar decisions can enhance student success. A review of best instructional practices and consideration of student safety and well-being refined the working definitions needed to guide the design and construction processes. This successful integration of conceptual planning, design, and construction extended the life of these two schools for several generations to come and strengthened the connection of our community with its public schools. Most importantly, we ended up with school facilities that work well for student learning. An informed commentary would have taken into account the most up-to-date education research which Bennett fails to do. Two recent, peer-reviewed studies support the need to update the traditional school design model that has remained fundamentally unchanged for over a century. In a 2011 study published by the American Educational Research Journal, entitled “Problem-Based Learning in K-12 Education,” Clarice Wirkala and Deanna Kuhn document a 200% – 500% improvement in learning retention with authentically student-driven, enquiry-based learning. This is precisely the type of teaching and learning supported by the varied spaces in FNI designs, including interconnected Learning Studios, DaVinci Studios, Common Areas with wet and messy zones and small Meeting Rooms. In a ten-year study published in 2011 in the Stanford Social Innovation Review, entitled “The Missing Link in School Reform,” Prof Carrie Leana documents higher learning outcomes when teachers collaborate in a meaningful way. The importance of treating teachers as professionals and providing suitable spaces for their collaboration is exactly why FNI provides teacher collaboration rooms with individual teacher workstations, storage areas and meeting space. Bennett seems to be saying that we should continue to build traditional factory model schools even as he makes that argument using an electronic forum that would have been unimaginable at the time the design of that model was conceived well over a hundred years ago. Regina’s educational leaders should be commended for building on the successes of the past and creating robust, agile, research-backed learning environments that allow students to succeed in a rapidly changing world. My commentary and Kate Hammer’s Toronto Globe and Mail feature story seem to have touched a nerve with Randall Fielding, principal and partner of Fielding Nair International. If The Globe’s Education Reporter is “shoddy and superficial” with her work, then I’m in good company. The commentary looks at the Fielding Nair International design philosophy and Douglas Park School is only an example. I’m actually examining the firm and its notion of architecture as “an agent of change.” Fixating on a single design is a little beside the point, but it may serve to calm school trustees asking pointed questions. School architects are professional experts, and having worked with them on a couple of major school projects, I know that they can be very dogmatic about their design principles. I’ve also observed that their designs have a “wow factor” that tends to silence skeptics and prevent full and open discussion of the impacts of their designs on teachers and students. “Getting your back up” has a way of foreclosing on open discussion. It sends out a signal that we are not to question or even look more deeply into the impacts of their designs on teaching and learning. International design firms go from city to city — and are long-gone when the “honeymoon” period with new schools comes to an end. The brilliant modernist designs of 1970 with box designs, walls of brick, tiny windows, and Walmart lighting, are the school monstrosities of today. I’ve learned, over the years, that ignoring community concerns can sew the seeds of dissatisfaction with the real user groups —teachers, students, and parents. As a parent, I went to a school where one could literally walk through the hallways from an easterly direction seeing the different time stamps, going back to 1852. Yet, from the outside the architectural design was respected. Lots of windows, big classrooms that made the classrooms bright with natural light, without the need of flipping on the light switches. Big bathrooms that could accommodate 40 students with ease. Classrooms had walk-in coat closets except in the newest wing built in the early 1950s that had ordinary coat closets, to accommodate larger classrooms. The last addition long after I left, was built in the late 1970s, to construct a new wing for kindergarten students, state of the art design, and a brand new gymnasium. From the outside, the same creamy brown bricks, lots of big windows, and somehow the design of the last addition, fitted the school’s architectural features.. However parents, nor the teachers were crazy about the open concept designed of the Kindergarten wing. I was still living in the area, and my oldest child spent her primary years in the school that I went to. What was once a school, where students learning and needs took central front stage, had now become a school that takes the needs of the teachers, the expanded centralized school board and always the union needs. What a shock it was to discovered that seniors of grade 6 to 8 were in the old primary wing. It made no sense to me, even though I was much younger. A few parents had walked by,and said, “Hey Nancy, I take it you are a bit shock?” Than they went on telling me about the other changes, and no parent was too happy about it. On my way out, the principal introduced himself, but first he had to apologized to me because he accused me of being one of the grade 8 students. My oldest child from that point on, forbid to wear any blue jeans and just dress clothes, if I was entering school for any reason. I asked the principal, what is up scattering the senior classes of grade 5 to grade 8, all over the place? Apparently, it was the new way of doing things. Yeah right, and today, the school is slated to close, and a new smaller school where everyone has to be bused, on a busy highway, will be its replacement. The school could have gone green, solar heating, renovations inside the school, could make the older architectural features stand out, in its former glory. All that lovely oak and walnut wood features in the older wings, retaining the names of students who carefully carved their names into the wood. Instead, the building of a new smaller school, built outside of the community………. Randall Fielding get real. You write, ” What I most admired about this process is that it focused first on student learning and anticipated the flexibility needed to meet diverse learning styles and needs. Staff and parents were involved in the deep discussions of how the bricks and mortar decisions can enhance student success. A review of best instructional practices and consideration of student safety and well-being refined the working definitions needed to guide the design and construction processes. The 21st century open-concept designs having little to do with student learning, but a whole lot to facilitate the needs of the school staff, and by extension the school board district. If it truly was, there would be big pow-wow meetings on the noise, by honouring the research especially for students who struggle in learning. The latest, that I read just yesterday. Another small breakthrough that concludes dyslexic brains hears fuzzy sounds. An open-concept school, would imposed a hardship for the dyslexics found anywhere and across the social-economic spectrum. A minor breakthrough, that confirms researchers conclusions how to instruct dyslexics, and certainly confirms many of the parents’ observations. More importantly, children who are dealing with dyslexic, before identification, often described hearing the words of teachers and classmates as fuzzy, My youngest child even said that back in the primary grades, and I can only imagine what an open-concept school, will do to dyslexics and their achievement and steady improvement in the 3 Rs. Now that just is one small part, of a complex education system, that has diversity in all ranges and tones across the bottom structure of the education system. And one will be hard-pressed to find the information on the school web sites, except under history of the school. Performance data is all about the teachers and the students and the parents. Designing-in “progressive education” is the central precept behind the Fielding Nair International schools. Prakesh Nair’s conception of “21st learning” looks a lot like old-style progressivism poured into new, open area classroom designs. School noise levels have become a major concern in Winnipeg’s public schools. Gymnasiums and open area classrooms test at the highest levels and some long-term gym teachers working in gyms measured at 90 decibels are reporting hearing loss. Have the Fielding Nair open area “learning commons” been tested for noise levels and their impact upon teaching and student concentration? If teachers are only acting as facilitators, then what is being done to limit classroom buzz and noise? These are not trifling matters. The Douglas Park blog, as well as the school web site is under lock-down and one needs a key. I went further, to see what literacy and numeracy stats are published. All the way to the ministry of education, Access denied. Open discussion on the new FNI schools? Debatable, and one would be hard pressed to find articles in the local news regarding FNI schools. If anything, public consultation is an after thought, and a very much controlled process. The first example – only parents who have children attending Douglas Park. Seen the same type of process and protocol in places in the United States. The identical protocol is in place for closure of schools, Decision is made by the school authorities, the public consultation takes places using very narrowed windows of opportunity for the forces that opposes the closure of the school, to present their case. I concluded, that FNI schools in Regina, public consultation took place well after the decision was made by the school authorities, and the consultation process was a series of selling the parents on the idea. On Real Renewal blog – “Regina – Parents and community members will gather at City Hall on Tuesday evening to talk about how their children and communities are faring in the K-12 school system. Very little in the news media at any stage, regarding the FNI schools in Regina. Noise issue – Check out the next few videos on FNI schools – The constant background noise of talking, chattering and the day to day background sounds of a school, will be very difficult for students who struggle in learning. The science advances being made in the learning fields. is already pointing to the direction that noise background impacts students learning, and more so for the students who have learning issues. So who is pushing for open-concept schools in the Education community? So who is buying into the concept? Two questions that should be explored, because it involves ideologies that has pushed the agendas and interests that does not have the best interests of children and their futures. What I cannot find out – are the outcomes of the students attending FNI schools. Over in Medford, Oregon – quite the busy and profitable industry of private tutoring and education therapies and programs, plus the growth of private schools, on the basics in the 3 Rs. Medford, only has two FNI schools, rated relatively high by the parents, but I could not find out the outcomes of students. More than likely, have to go to the State level, and national level to flesh out the numbers for the two FNI schools, in Medford, Oregon. Leave it to America and it won’t be found in places like Canada – Acoustical Society of America. ” Excessive noise and reverberation interfere with speech intelligibility, resulting in reduced understanding and therefore reduced learning. In many classrooms in the United States, the speech intelligibility rating is 75 percent or less. That means that, in speech intelligibility tests, listeners with normal hearing can understand only 75 percent of the words read from a list. Imagine reading a textbook with every fourth word missing, and being expected to understand the material and be tested on it. Sounds ridiculous? Well, that is exactly the situation facing students every day in schools all across the country. The main bulk of research and studies concerning background noise, can be found with the sciences of learning, cognitive, and specific fields in learning disabilities, dyslexic or autism. What cannot be found, within the public education system and its research – noise background and its impact on student’s learning. I concluded, that FNI schools and its concept – are deliberately avoiding the weaknesses that are inherent concerning open-concept schools. Want everyone to focus on the bells and whistles, in a public education system that is structured to deliver a basic education without being held accountable for the outcomes of students. In short, the FNI schools will magnified and enhance the uneven levels of proficiency in literacy and numeracy, compared to the schools of enclosed classrooms. It be a disaster for students with disabilities, because many students with disabilities have problems with background noise and their learning. The Acoustical Society of America is not particularly fond of Open Concept School models or “open area classrooms”. I particularly like the photograph of the “Open Area Classroom” identifying it as a type of learning space posing serious problems from an acoustical point of view for students and teachers. Might as well include everything one needs to know about the science of sound, but was afraid to ask. It sure looks that the Fielding school, neglected the science of sounds, especially the grade 5 unit in science, under sound. Perhaps, the grade 5 science class located at Douglas Park, could conduct experiments on their school, on noise pollution, and connect it to the learning impacts it has on students. Say it ain’t so – low sound frequencies impacts the human body’s physiology. Try living for 4 days, with the constant drone of the wind beating down upon the home. It drives me crazy, and it makes me one very grumpy person. Imagine the noise effects of high to low frequency sounds bouncing, and careening off in an open-concept school done the 21st century way. Than add the outdoor sounds, the man-made sounds of a helicopter flying low in the sky, or the drone of high hydro transmission lines and the constant background hum that is amplified 24 hours a day in highly urbanized areas. One of the reasons why it is such a blessed relief, to get out of the city and all that noise. The science is in its infancy concerning sounds, but it certainly packs a wallop, putting cold water over open-concept school buildings. “The evidence for effects of environmental noise on health is strongest for annoyance, sleep and cognitive performance in adults and children. Occupational noise exposure also shows some association with raised blood pressure. Dose–response relationships can be demonstrated for annoyance and, less consistently, for blood pressure. The effects of noise are strongest for those outcomes that, like annoyance, can be classified under ‘quality of life’ rather than illness. What these effects lack in severity is made up for in numbers of people affected, as these responses are very widespread. The trouble with sound, because it affects people differently. I know, I would never live beside a wind turbine, high hydro transmission lines, or put up with a steady low frequency hum radiating from my hard drive. And don’t even mention vacuum cleaners, or the steady thumping sound of the guy next door, playing his guitar, poorly I might add – where I feel the vibrations and not hear the poorly played guitar. And for a bit of fun and relaxation – an inventor – never been to college – on his sound inventions. Norris’ educational background is a key to his restless mind. He is not quite “self-educated” — he’s taken many classes, but always at his own speed and in his own style, studying the things he knew he wanted to know and working closely with professors. Ironically, it’s a model that cutting-edge colleges are now embracing. I did some writing about this topic back in May 2011. I find the conversation about schiool design rather compelling. I need to back over some of the responses from all that have contributed to Paul,s conversation. Thanks for tackling this one! I’m looking for Gislason’s book, but unable to find it in the OISE library, at Chapters or at Amazon. If anyone knows where I can obtain it, I would be very interested in adding it to my collection! I have always like the way the Regina parent thinks. The 21st century term of the supercentre school. The real world doesn’t operate in that fashion, and who indeed would want their children in a school without a playground and sports field? Only the educrats…. As a parent of children who attend the new Douglas Park school my only comments are this: They do not do well in a giant class with 45 or more children! This is factoring in student/teacher ratio, and all the comments of “professional” educators and members of our school board. My kids are struggling because of the amount of distractions and noise that a school with almost no walls provides, whereas in the old Douglas Park they consistently excelled in school. My mother and I (who was an educator herself for over 25 years and taught at Douglas Park) have had to work twice as hard at home to supplement their education because of the challenges of this new school design. Many studies have proven that smaller class sizes lead to better outcomes and it utterly baffles me that our school board is willing to use my children as guinea pigs in this educational experiment. I am not an expert in education and I will never claim to be so, but I have seen first hand the results of Barbara Young and the Regina Public School Board’s “new” ways of thinking. I am not the only parent who feels this way, it is a very hot topic around coffee tables and playgrounds in our area. A large amount of parents in Douglas Park are upset and feel as if the board of education has let them down. It has been clear for some time now that the focus of our school board is bureaucracy and not education. Global TV News Regina has filed a report (September 5, 2013) on Brigitte Zerr’s concerns about noisy, overcrowded classrooms as the new Douglas Park Open Concept School. The News Story by Sarah Richter,”Regina parent worries “innovative” teaching method not helping students,” chose to focus on the teaching methods rather than the design-built environment and its limitations for teaching kids requiring more quiet or perhaps a more focused learning environment. “Our kids came home saying, ‘Mom there are 49 kids in my class’,” said Brigitte Zerr, whose son is in grade 6. When the school opened in September 2012, the Regina Public School Board said it was leading-edge, with large classrooms to accommodate big groups which can be divided into smaller rooms for more intimate learning. Zerr, however, feels it could hurt her son’s education. “He said, ‘you know mom, I found it really noisy, but they told me to bring an iPod’,” she explained. There are at least two teachers for the class, but with 50 kids the fear is some students will fall through the cracks. Regina Public Schools says it is part of “21st Century education.” The focus is on being flexible with the space and have teachers working together to make sure each child succeeds. In Regina, Arcola and Douglas Park schools both follow that model. The goal is to expand the concept to all new facilities that are built. Global News reports that Zerr met with the school board this week but is still not sold on the method. “I’m not entirely convinced that my child and other children learn in a completely different way from what we did,” she said, though she admitted her son enjoyed having all his friends in one room. It’s beginning to sound familiar! I came across this blog recently, and have enjoyed reading over the original article and the comments. I’ll post a short comment here (limited time), but will follow up later. Also, I’ll be happy to answer any questions about my research – it seems that there might be some interest in it. First, I’d like thank to Dr. Bennett for his thoughtful and timely discussion. Dr.Bennett, I feel, overstates my concerns about disciplinary issues and environmental distractions in open plan schools. These are potential issues, which are more likely to be significant for students who are prone to visual, auditory, and/or social distraction. I researched one open plan school in Minnesota that provides (in my opinion) a very good learning environment for the school’s students. I also visited other schools where the open plan setting is overly distractive for the students attending those schools. Student dynamics (determined largely by a range of demographic factors) inform the total learning environment, along with physical design and organizational dynamics. Physical design is simply one environmental element among others. Earlier today, I did an interview with a talk radio station in Regina. I was brought in as a “middle ground” voice in the controversy surrounding the Douglas Park school. Open plan school design evidently has some legs as a topic: in the last year or so, it has hit print (the Globe and Mail feature); TV; and now, radio – not to mention this blog, which my interviewer had read. I wonder how the Regina school board feels about this publicity, and if the public debate might encourage other boards to think twice before embracing open plan architecture. It’s probably healthy that the media are sounding a note of caution in this regard. The rhetoric spun by the most aggressive open plan advocates is seductive, and is often based on weak or distorted research. This rhetoric has gained some traction in part because the dismal track record of open plan schools has slipped largely from our collective memory. The historical record is important because the “new” plans are in fact closely related to the open concept schools of the 60′s. There were a wide range of open concept plans executed in the late 1960s and early 1970s, many of which included flexible partitions, as well as a mix of closed and semi-closed areas designed to accommodate a range of teaching practices. Further, the educational concepts associated with the “new” models can all be traced back to mid-1960s, and in many cases earlier. It may be that we are now looking at a point in history where we are at risk of repeating the past because of our broad ignorance of it. Yet, it would be a shame to abandon open plan school architecture entirely. When executed properly, and under the right circumstances, open plan schools can work well. They are great for team teaching, interdisciplinary curriculum, and project-based learning. But you need students who are strong self-regulators, and an administration and public willing to support unconventional educational methods. You also need an appropriately trained staff that is fully on board. All of this, indefinitely. Otherwise, as history shows us, the open layout will be abandoned and walls will be built, so that teachers can return to traditional classroom teaching. Thank you for contributing so much to a fuller and deeper discussion, Neil. My initial commentary focused on Prakesh Nair’s July 2011 Education Week piece which declared “traditional classrooms obsolete” and sparked this whole debate. That piece aimed at so-called educational progressives was strangely reminiscent of what we were fed in the 1960s when the “Open Concept Plan” was presented as some kind of panacea. You will note that Randy Fielding’s lengthy response side-steps my criticisms of Nair’s overblown rhetoric and instead tries to shift the terms of discussion. You bring a nuanced understanding of the design, its strengths and weaknesses. In my case. I’ve actually taught in all of these different styles of classrooms and lived that experience. It may surprise Randy Fielding and Prakesh Nair to learn that I was a “progressive teacher” who actually preferred smaller. more intimate classrooms. So did my students. My teaching colleagues absolutely hated the open area classrooms because they were a nightmare if you had any disciplinary issues at all. Indeed, if a student acted out, it was everyone’s business. I was dismayed to learn that the literature generated by architects and defenders of the model denied the existence of such concerns or minimized them. Teachers and parents defeated the first Open Concept ideology and plan through “passive resistance” and may do so again. I cannot believe that today’s teachers with far more designated special needs kids will be any more receptive. Back in the late 1960’s, the pedagogy supported “learning at your own pace” and there were no standardized learning assessments. Teachers were free to “do their own thing” and they still resisted teaching without walls. In addition, special needs kids were then in self-contained classes, so it might have been easier then to implement this problematic design model. Regina Public Schools is the Canadian school board most committed to the Fielding-Nair ideology and the thin edge of the wedge. Time will tell, but I continue to believe that F-N have got it backwards. Building flexible size and type smaller classrooms (traditional, seminar, dry labs, and even pods) , more crush space and wider halls will win out in the end. When this happens, Prakesh Nair’s Education Week piece will likely be cited as the reason why. “Noise annoyance” is the term used by acoustics experts to describe the effect of poor classroom design on student learning. A recent academic paper, “Effects of Classroom Acoustics on Performance and Well-Being in Elementary School Children: A Field Study,” illustrates the potential problem. Maria Klatte, Jürgen, Hellbrück, Jochen Seidel,and Philip Leistner delivered the paper at Internoise 2010, Lisbon, Portugal, on Jun 13, 2010. Perhaps the parents at Douglas Park should be asking for acoustics testing in those open area classrooms. Surely cost is not a factor for a major international firm like F-N and its local client, Regina Public Schools. It conveys the familiar “Buildings ‘R Us” message and leaves the unmistakable impression that Douglas Park is an OPEN CONCEPT SCHOOL. Let’s face it, Fielding-Nair is a new build architectural enterprise with little or no interest in renovating older schools or in adapting them for modern use. The transformative story of John A. Johnson Achievement Plus Elementary School – a struggling St. Paul, Minn. public school – shows how older schools can be reborn as a beacon of academic excellence, design innovation, and community involvement. In keeping with the latest thinking in school design and planning, this project also won the Richard W. Riley Award for Excellence for Schools as Centers of Community. Believe it or not, John A Jonson School is in Saint Paul, MN, not far from the world-wide headquarters of Fielding-Nair International. Which approach do you think best reflects advanced thinking about school design, community-building, and urban revitalization? A very interesting discussion of the ideas of a couple of architects who would seem to be joined at the ideological hip to the likes of Sir Ken Robinson. One issue that doesn’t seem to have been raised so far: individuality. Randall Fielding comes across as a nice example of a person with a strong sense of their individuality and a willingness to take a firm stand against received “wisdom”. That individuality came into being, partly, through the experience of submitting to an industrialised educational system. An interesting question for those of us who believe that the 21st century needs critics even more than it does inventors and entrepreneurs is: Does this model of education – where everything is supposed to be integrated and connected (“work, living, and play – it all becomes the same thing”) and where there is supposed to be a perfect fit with the particular “learning modalities” of the student – does it recognise the value of a critical individuality? Question for further research: What will become of the individual in this bright and colourful open-plan 21st century education? I was a student in an “Open Concept School” from grades 4-6. I excelled learning at my own pace, I was reading at the college level after the 4th grade. I never had a problem focusing in this environment. I can only assume that the three years I spent in an “Open Concept School” helped me to function effectively in real life situations. I am finishing up my PhD now. I read many negative opinions posted here about not serving the students, based on my experience “Open Concept School” serves to educate very well. I was desperately bored in traditional classrooms where I was taught and retaught what I already knew. Traditional classrooms serve teachers who want to develop, present material, and grade everyone in a batch. This does not serve students. This seems like an easy fix. Let the architect design both open spaces and enclosed learning classrooms within a structure, and let the teachers decide what is best for that particular group of students. Am I missing something? It doesn’t have to be one or the other, just find a middle ground. on June 12, 2015 at 8:30 pm | Reply mike. So I’ve taught in a few different schools – private schools with 1:1 tech ratios and high levels of affluence, public schools with large classes with a heavy mix of socioeconomic status and technology access, public schools with low socioeconomic status and low tech access . . . and I think when it comes down to it, critical thinking and problem-solving skills are not based around a space or design. Have good lesson design, pay attention to student interest, and provide feedback that shifts towards growth – those are the key aspects to improving student performance, not the design of the space. A “traditional” classroom does not need to be an industrial revolution holdover if you know what your students need to learn, and how to engage them in the material. You want an idea for educational reform that I don’t believe has been tried on a large-scale that I feel can seriously improve education? Keep the same class of students for the entirety of a school system (i.e. move up with kids every grade level for several years – teach 9th-12th grade English to the same group). You learn so much more about your students and their needs and areas for improvement, and can really learn to differentiate based on the personalities, learning styles, and needs of a classroom. You can create a community focused around learning in the first year and hold that community for four – and by the end of those four years, the kids crush whatever they want to do next in life, because you really know them well and know what they want to do next! Reblogged this on Jess' Capstone.